I love this night shot. Really beautiful way to capture an awesome fountain. 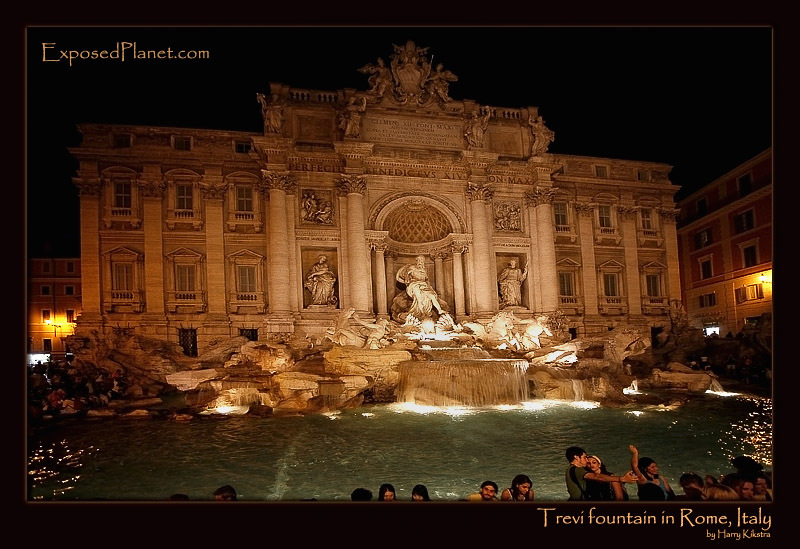 The story behind "Trevi fountain at night in Rome, Italy"
Finally finished in 1762, the fountain is named after Trivia, the virgin who apparently lead the Romans to a clean water source in 19BC. It is a very popular spot in Rome, with people visiting day and night. Newlyweds have their pictures taken here and tourist couples photograph themselves. And people come to throw coins in the water, apparently ensuring a safe return to Rome. What it did insure for sure was that homeless Roberto Cercelletta made his living for a few decades, scooping part of the approximately €3000/$4000 that is thrown in each day. As the coins are legally discarded property he could not be arrested until a law was effective that banned entering public places/monuments, including historic fountains. The rest of the money is collected daily and used to help AIDS patients and to fund a supermarket where the homeless and needy can get food and necessities. So even if you do not come back to one of the most beautiful cities in the world, you will help its less fortunate inhabitants. PS: this is the location of one of the most famous film scenes in history: Anita Ekberg who stands as a goddess in the fountain, in front of the Neptune Statue in Fellinis La Dolce Vita.